As an eco-conscious woman, I am so pleased to discover companies like North American Hemp Co. that provides naturally derived products that are safe to be used by my entire family. At North American Hemp Co. I don’t have to worry about harsh, irritating chemical ingredients because this product line is sulphate and paraben free, DEA free and all natural. Made in Canada, this company is proud to produce a full line of products that are cruelty free and vegan too! 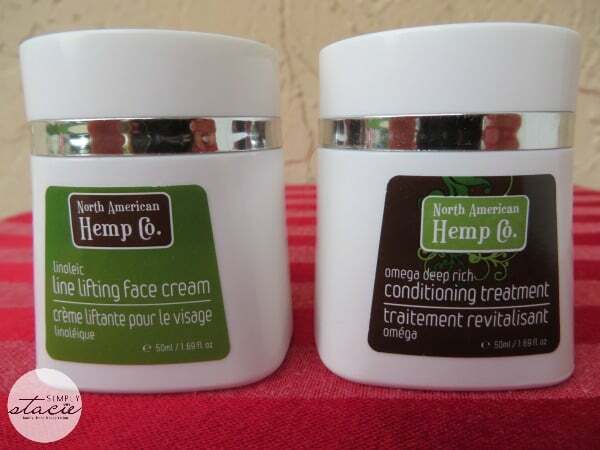 My family and I are currently using several products from North American Hemp Co. including the Face Off Face Wash, Omega Anti-Age Facial Lotion, Linoleic Line Lifting Face Cream, Hemp Exfoliating Face Cloth, Soak It Up Moisturizing Shampoo, Soak It Up Moisturizing Conditioner, Omega Deep Rich Conditioning Treatment and Area 369 Hair Serum. To keep my facial skin looking healthy and clean, I like to use the Face Off Face Wash followed up by the Omega Anti-Age Facial Lotion. I use a tiny amount of product as a small amount goes a long way, lathering up on my face and then using the Hemp Exfoliating Face Cloth to massage the cleanser into my skin. This all natural formula contains certified organic hemp seed oil which effectively removes all traces of dirt, grime, sweat and makeup. It feels refreshing and I like that my skin feels clean without any extra dryness as my skin has become quite dry with age. I especially like the Hemp Exfoliating Cloth which is gentle yet effective in making my skin look clearer and even brighter. Some exfoliating products can be irritating or cause my dry skin to become even drier and yet I have not experienced this at all when using the facial cleanser along with this face cloth! In the morning, I apply the Omega Anti-Age Facial Lotion to my face and neck after cleansing and really notice a difference in the hydration level of my skin when using it. The creamy formula is not heavy at all and absorbs effortlessly into my dry skin. It stays moist all day and my skin feels softer and smoother. At night, I use the Linoleic Line Lifting Face Cream all over but primarily on my laugh lines and the squint lines on my forehead between my brows. I also notice that it feels quite soothing especially when I use the tapping method of application as suggested by the product instructions. I have long, highlighted blond hair so keeping it in good condition can be a daunting challenge especially when trying to use natural products. Thankfully, the Soak It Up Moisturizing Shampoo and Conditioner has worked wonderfully to keep my hair looking shiny with less frizz. Despite being sulphate free, the Moisturizing Shampoo lathers up nicely so my hair feels clean after rinsing. I have to use a conditioner in order to keep my hair looking nice and in order to detangle it and I really like the Moisturizing Conditioner. The pump top bottle makes it easy to control the amount of product that I use and this creamy formula works beautifully. I work the product through my hair and then use a wide toothed comb in order to disperse it and make detangling easy. All of the naturally derived ingredients work synergistically together to make styling easier. I often let my hair dry naturally so this has enhanced the wave/curl with less frizz and it also works when I want to blow dry and straighten my hair. To finish my style or to help when I need extra detangling, I love the Area 369 Hair Serum which makes my hair shine and feel like glass instead of a frizzy mess. I have finer hair so any serum that I use cannot be heavy and this particular products provides just the right amount of frizz control without making my hair greasy. I also like that a tiny amount of product does the job and I haven’t noticed any build up at all after using for two weeks. If you have dull, dry hair (like I do sometimes) then you may really benefit from using the Omega Deep Rich Conditioning Treatment. I apply a small amount of this product to my dry hair, working it through and then putting on a cap which I wear all night. In the morning, I rinse with cold water and my hair feels amazingly soft and smooth. This is going to be my go-to product this summer as I spend a lot of time at the beach and the pool. If you are looking for natural alternatives to chemical laden hair, skin and personal care products then I highly recommend trying out the collection from the North American Hemp Co.
I’d like to try the All Natural Lip Balm in Mint-O-Licious! I would like to try the Extreme Moisture Body Cream. 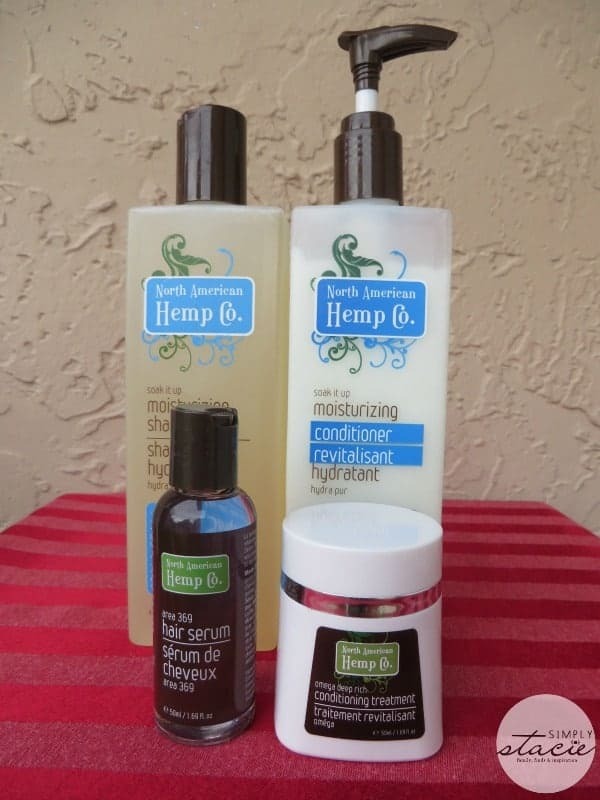 I love the North American Hemp Co.Body wash but also would love to try the Hair Serum.Thanks for the great giveaway! the extreme moisture body cream! I would like to try the Omega Deep Rich Conditioning Treatment. I would like to try the exfoliating face scrub. I want to try the Omega Deep Rich Conditioning Treatment! I would like to try the Rise and Shine Energizing Body Wash. I would like to try the Area 369 serum. I have waves and I am always looking for great products to use with them. I would like to try the line lifting face cream. The line lifting face cream for me. I would love to try the Smooth Seal line! I would love to try the Hemp Cloth. I’d like to try the Refreshing Body Wash Gel. I like the hemp holy grail body cream and oil and so much more. Very interesting for sure! any of the face products… gotta try it all, see what works. not even beauty sleep does. Would love to try the extreme moisturizing cream!!! thanks for the chance! The green apple natural lip balm would be what I would love to try first! The Hemp Holy Grail body lotion or the extreme moisture body cream would be interesting to try. I would love to try the body washes. I’d love to try the Line Lifting Face Cream! I would love to try the exfoliating body wash! I would like to try the face wash! The Omega anti face lotion looks good. I would like to try the Energizing BodyWash. Hope this will help with my get up and go in the mornings!